Bad Online Reviews? Here’s What to Do! Ouch! That hurt. The review above was originally posted in 2012, but it’s still online for all to see. That’s the problem with online reviews – they never go away. It’s not like you can ignore them, either. Not when 90 percent of consumers say positive reviews influence their purchases. Not when 82 percent of consumers do their product and service research on review sites before they purchase. That’s all well and good if your reviews are positive. But, what if they’re not? 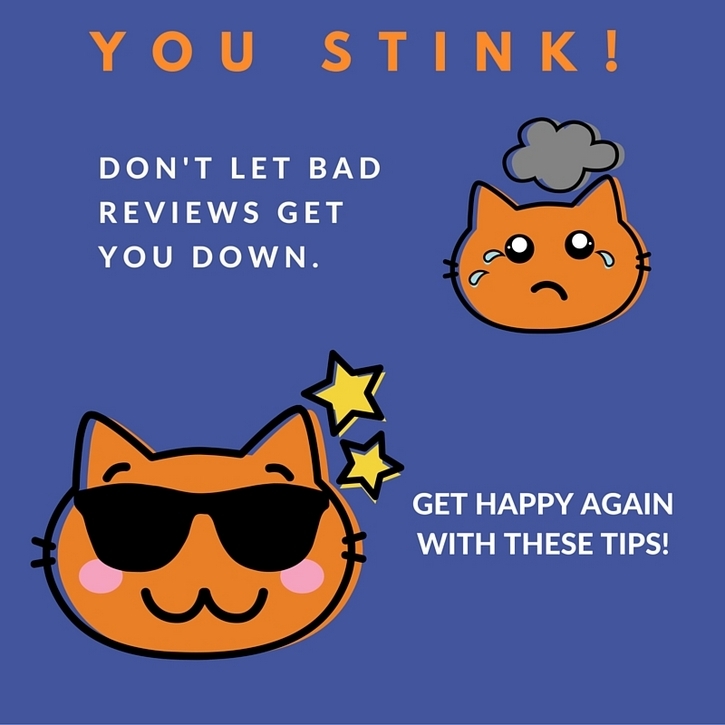 You Need Reviews, You Really Do! Many businesses solicit reviews. You’re probably wondering why. Why open yourself to getting shot down? Are online reviews so important? In a word – yes. One of the biggest advantages of reviews and review sites is that they show up on search result pages. Reviews give your business exposure it would not otherwise get. They build credibility and encourage online word-of-mouth advertising. Honest reviews provide valuable insights into your business procedures and show you where you need to improve. And, the good news? The majority of reviews on sites like Yelp, Google and Facebook are positive. Of course, it’s the negative reviews that stick in the craw. And you will get negative reviews. It’s what you do about them that counts. You can’t let a bad review sit for too long without doing something. Stay on top of reviews as they happen. Claim your business pages wherever you find them and make sure the information is correct. Fix it if it’s not. Set up automatic alerts in Google and Yelp to monitor new reviews. When the dreaded time comes and someone posts a bad review, take action. Respond Publicly: But, not until you count to 10, take deep breaths and calm down. Negative reviews, particularly when they seem unfair, are maddening. No question about it, you’ll be steamed. Respond politely, thanking the customer for the feedback. If you screwed up, apologize. A calm and friendly response coupled with a resolution go a long way to neutralize a nasty review. Your response stays online as long as the review does, so the way you handle it says as much about your business as the review. Respond Privately: Depending on the severity of the complaint, you may also choose to contact the reviewer via private message. Again, be polite. If you handle it correctly, you just might save the customer and rebuild goodwill. There’s always a chance that, if made happy, a reviewer will post a more positive review update. Check Validity: The catch with online reviews is that a few are fraudulent. They could come from a disgruntled former employee, an ex-spouse, a competitor or someone who has too much time on their hands. If there are clear signs that a review is fraudulent, respond once with a courteous remark and ignore it thereafter. Perform a Gut Check: Ask yourself if the reviewer had a legitimate complaint. Is there room for improvement? What can you do to make sure the same thing doesn’t happen again? Reviews are a great way to communicate with customers and give them a better experience in the future. 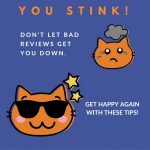 How much should you fret about bad reviews? It depends. It turns out you need a few. People expect to see good AND bad reviews. If all they see are five-star raves, they become suspicious. All those positive reviews can’t be real. A negative review or two actually builds trust. But – you knew that was coming - you have to have a small negative-to-positive ratio. Watch for common denominators in the negative reviews. If every negative review says the customer service was appalling, something’s wrong. Fix it. Then work on getting more positive reviews. The best way to get honest, positive reviews is to ask your satisfied customers to provide them. Send customer satisfaction surveys, provide links to review sites and ask recent purchasers to rate their experiences. Your best customers are also your best cheerleaders. Two caveats - never purchase reviews. You’ll pay big time if you’re caught. Not to mention the fact that it’s not honest. And, never give customers a tablet in your place of business and ask for an immediate review. Yelp and other review sites filter out multiple reviews when they come from the same IP address. The bottom line: Accept the fact that you’ll get negative reviews. Deal with them and move on. One bad review isn’t the end. In fact, if you’re proactive and handle it right, you can turn a bad review into an opportunity to build trust and goodwill.